The passenger compartment remained stable in the frontal impact. Readings from the driver dummy's chest indicated a contact with the steering wheel and the car was penalised by one point. Protection of the knees, femurs and pelvis was good for both the driver and passenger. The car scored maximum points in side barrier impact. In the side pole test, protection of the chest was rated as marginal owing to the extent of rib deflection recorded by the dummy. Whiplash protection was poor, the seat scoring no points in two of the three dynamic tests and losing points for the poor position of the restraint when unadjusted (fully down and back). Based only on the dummy responses in the tests, the car scored maximum points for protection of the 3 year infant. For the 1½ year old, Euro NCAP awards fewer points for a forward facing restraint than for a rearward facing one but the dummy readings were all good. The passenger airbag can be disabled to allow a rearward facing child restraint to be used in that seating position. However, information provided to the driver regarding the status of the airbag is not sufficiently clear. The presence of ISOFIX anchorages in the rear outboard seats was not clearly marked. The car scored maximum points for the protection offered by the bumper. However, poor head protection was provided over most of the bonnet surface. ESC is available on the C3 Picasso but it is not standard equipment on all variants. The star rating reflects a car without ESC as sales of the system are not expected to reach Euro NCAP's requirements. A driver-set speed limitation device is also available as standard or as an option. 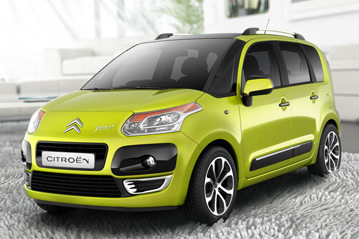 As Citroen expect to sell most vehicles with the limiter as standard equipment, its score has been included in the overall rating. The device allows drivers to set a speed to which the vehicle will then be limited. A seatbelt reminder is standard equipment for the driver's seat and standard or optional for the passenger and rear seats. Sales of the passenger SBR are expected to reach Euro NCAP's requirements; sales of the rear seat system will not. Therefore, the overall rating incorporates the scores from the driver and passenger systems.